I began yesterday with a brief review of Rosemary Sullivan’s powerful biography of Svetlana Stalin. But there was a second book which occupied me during my recent vacation which I found also well worth a hearty recommendation. The book’s title is “Heaven Below: Early Pentecostals and American Culture.” It is by Duke University historian Grant Wacker, and it is a fascinating study to be sure. Let me note that this particular study has a deep personal connection for me. 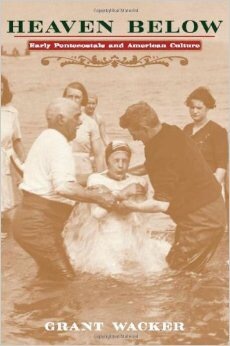 For though Wacker focuses chiefly upon the 1st generation of the American Pentecostal Movement, from the late 1890’s into the 1930’s – my own heritage emerges from this context in the very next generation. I say this, for it was in 1935 that my Grandfather, George Shea founded Faith Tabernacle in Rochester, NY – later to become the still thriving Faith Temple. That being the case, when Wacker cites Elim Bible Institute, the Rochester Bible Institute, and names like Ivan Q. Spencer, Susan Duncan (of the “Duncan sisters”), Stanley Frodsam and John Alexander Dowie and others – these are places and personages that formed part of my own consciousness growing up in that tradition. From there he investigates the formation of the Assemblies of God, its near demise over the “Oneness” issue, the founding of numerous Pentecostal denominations including the Foursquare Gospel Church under the aegis of the famous (or infamous – depending upon your view) Aimee Semple McPherson, and much much more. I was made aware of the book after hearing an interview Grant Wacker did with Dr. Al Mohler about it. It grabbed my attention from the outset and I was rewarded with a rich, fascinating, rewarding and insightful study. Dr. Wacker writes as neither a detractor nor supporter. This is no “hit piece” nor is it hagiographa. He looks at the movement as a simple, matter of fact reality, comprising an important part of the Evangelical landscape in America. Doing extensive research in as many of the primary sources he was able to comb, Dr. Wacker investigates not simply the formation and progress of the movement, but its varied manifestations, predominating demographics, unique features, prevailing attitudes toward things like war, the role of government, attitude toward non-Pentecostal denominations, race relations and the roles of men and women in leadership – to mention just a few. He truly strove to reconstruct as fully featured a portrait as might be possible. A portrait which I found hauntingly familiar to me, as well as one correcting some misnomers and presuppositions that may have been formed by myself, or in our little corner of the movement. By “primitive”, Dr. Wacker is not using that word as a pejorative, but as short hand for the Pentecostal’s desire to return to the “primitive” roots of the Church as exemplified in the “Pentecostal” outpouring of the Holy Spirit in Acts 2. And by pragmatic, he is not asserting any failure to look to the immediacy of The Spirit in their worship and lives, but simply, that as much as they sought the everyday experience of the divine as they understood it, they also lived in the real world and still lived in regular neighborhoods, held down regular jobs and took practical steps in regulating their worship and lives as needed. They weren’t (with a few exceptions) so “heavenly minded that they were no earthly good.” In fact, they very much fell into the mainstream of middle America as it was then. Be you a continuist (believing that all the gifts of the Spirit can and do function today) or a cessationist (one who holds that all of the “sign” gifts ceased after the Apostolic generation) or somewhere along the continuum between the two, this book is important because of how much this movement impacted – and remains an influential aspect of – American Evangelicalism. For me personally, it helped frame much of my own familial and church milieu in far more cogent ways than I had previously understood. And even if none of those things applies to you – it is a wonderfully engaging read. You’ll not be sorry you picked it up.